The GoCPS application period opens next week, but whether you apply on October 1st or December 14th, you have the same chances of receiving an offer to a program of your choice! It is a common misconception that applying early gives families an advantage in selection when, in fact, it does not. The selection process that generates offers for all applicants is run after the application process ends, so it is important that you take your time and use the full application window to plan and make good application decisions. Account creation will be temporarily suspended this week as we change the system over to application mode. However, there are still a lot of things you can do before submitting your application. Here are some of the most important ones. 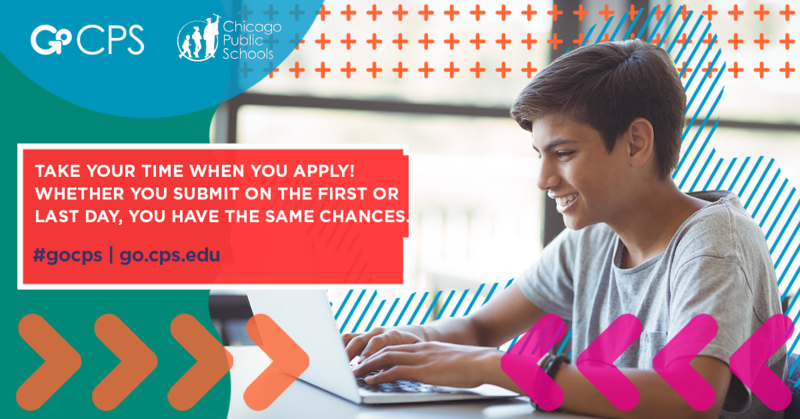 Even after you submit your application, you can still make changes to your school choices, up to the December 14 deadline. Keep researching and talking to school leaders after you submit to make sure you’ve made the best selections. If you want to re-rank your choices, you can do so up until February 1st. (Note that you cannot add new programs to the application after the December deadline.) Contact the Office of Access and Enrollment at 773-553-2060 or gocps@cps.edu for re-ranking instructions after December 14th. Be sure to visit the high schools in which you are interested by attending an open house. Check out the Dates and Events calendar at GoCPS to view these events by date, or search by school or zip code.